Batley Boys bowed out of the BARLA National Cup with a 24-6 defeat away to Widnes West Bank on a frustrating afternoon, which saw them have a man sent off and three others sin-binned. The Boys travelled to Widnes in great spirits following their Yorkshire Men’s League Premier Division title success last season and they started well, with Aaron James, Ryan Crossley, Matthew Sheridan, Sean Sheard, Gav Davies and Josh O’Sullivan taking them forward and looking solid in defence. 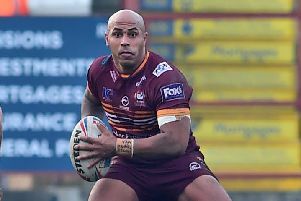 Both sides were reduced to 11 men as Batley’s Ryan Crossley and Josh Whitehead were sin-binned for retaliation along with two West Bank players. Batley were then reduced to 10 men when Gav Davies was sent off , despite appearing to be head butted while on the floor. The home side scored two first half tries to open up a 10-0 interval lead but the Boys defended extremely well until they were restored back to 12 men, although they struggled to put West Bank under pressure. Batley started the second half superbly with Ben Denville and Dan Scales both introduced from the bench to help them mount attacks with support from Lewis Hardy and Damien Fletcher. A Matthew Sheridan high kick was collected by Aaron James, who raced away to score between the posts and Adam Bingham converted. Batley were on a roll but any close calls appeared to go the way of the home side and the Boys efforts were further hampered when centre Josh Whitehead become a third visiting player to be shown a yellow card for speaking out of turn. West Bank piled on the pressure but last ditch tackles by Rob Bingham, Josh Scruton and Jonny Marsden kept them at bay. Eventually the pressure told and the home side ran in three late tries to seal the game and give the final scoreline a flattering look. The Boys were well supported in Widnes and now set their sights on Saturday’s historic Ladbrokes Challenge Cup tie away to Underbank Rangers. Widnes West Bank will travel to either Ossett Trinity or Thatto Heath Crusaders in the National Cup second round on Saturday February 3 when Thornhill Trojans also enter at that stage of the competition and face a trip to Orrell St James. First round: Ossett Trinity v Thatto Heath — postponed, to be played Saturday February 3; Wyke v Queensbury — postponed, to be played Saturday January 27; Queens v Haydock — postponed, to be played Saturday February 3; Hensingham v West Hull — postponed, to be played Saturday February 3; Orrell St James 18, Upton 16; West Bank 24, Batley Boys 6; Doncaster Toll Bar 11, Oldham St Annes 13. Second round: Ossett Trinity or Thatto Heath v West Bank (February 10), Eastern Rhinos v Seaton (February 3), Glasson Rangers v Ellengbrough Rangers or Wigan St Cuthberts (February 10), Oldham St Annes v East Leeds (February 3), Wyke or Queensbury v Queens or Haydock (February 11), Hensingham or West Hull v Sharlston Rovers (February 10), Orrell St James v Thornhill Trojans (February 3), Ovenden v Hunslet Old Boys (February 3).